Recently I received bottles of Mother’s Therapy Organics Hand Sanitizer, Germ Fight’n hand lotion and a keychain with a 2 small bottle of hand sanitizer attached to review. These hand sanitizes are different than the ones you get at the local drug store as they have organic moisturizers included in them. They have a fresh cucumber scent that is not overpowering. I’m not crazy about regular hand sanitizers but these seem to be different because of the natural ingredients that won’t dry out your hands. I seen the effect of regular hand sanitizers because my son lately has been getting over zealous in his use of them at school. His hands became so chapped and overly dry that they actually bled. I gave him a small bottle of the Mothers Therapy to take to school with him instead. I especially liked the lotion because it gives extra moisture to your hands. If your looking for a natural hand sanitizer that is not drying and has harsh ingredients this is a good choice. Check out their website for more information. Here is a video of the hand sanitizer in use at school. It’s in use at some Goddard schools. They even offer large stand up dispensers for companies. You may want to let your work know about these dispensers that are much safer than regular sanitizers and work just as well. Here is your chance to try out the natural hand sanitizer I just reviewed. 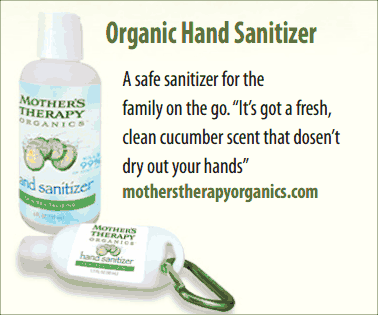 You will receive a family pack of Mothers Therapy Organics hand sanitizers. $30 value. Just Enter Below.